VICL-69029 / aosis records / Victor Entertainment,Inc. These are the entities that should be called the star artists at aosis records, this is an aggregate of the top musicians that represent Japan's pop scene, nanan. Their second album is finally here. 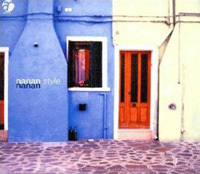 As the title of the album states "nanan style", has matured beyond the first creation, and has served to polish the unique style of these artists which all crammed full of goodies, yet at the same time exhibits a relaxed kind of sound throughout the album. This time as on the last album the recording was done in Hawaii. Plus the magic of those Hawaiian Islands, has a great influence on their sound, and everyone in the band says the same thing. "With members like this, we could make we could make something with a certain kind of high quality but this space or rather, the overall flow is something that can only be brought out in Hawaii. Certainly, this relaxed feel and the pleasantness of spaces in this song draws a line from the hustle and bustle of our daily lives. Then the masterful art of the members of nanan work their magic to make this something even more heartful. This is a 1967 hit song that took the #7 spot on the US music charts, by Fifth Dimension, a chorus group that was successful in the US in the late 1960s. The gorgeous sounds and vocals combine into one to announce the beginning of the second trip of nanan. The vocals by Junko Yamamoto with such clarity are an excellent fit to the song. This is the most famous song by a songwriter who represents Brazil, Jorge Ben that became a hit, we are familiar with, in 1966 with Sergio Mendes & Brazil 66. This kind of easy-going samba is an area where nanan is unrivaled. Then the atmosphere of Hawaii is conducive to make that kind of rhythm even more laid back. The atmosphere of Hawaii and the members of nanan have come together as one to evolve sound that should be called magic. This is a Kenji Takamizu original. He says "I was touching the bass and came up with this naturally" about the song, it is a number that expresses his romantic side skillfully. This is a number composed in '58 by a great composer out of Brazil, Antonio Carlos Jobim, which has also been done by Stan Getts and Carmen MacRay. This is the first Bossa Nova song that Motoya Hamaguchi fell in love with and at that time listened to the record so much it practically wore itself away. Motoya Hamaguchi's vocals bring out a great flavor to the song. This slow kind of rhythm that sounds so easy to make, but in actuality is a sound that cannot quite easily be done. This is an old chanson number that was a hit in America under the translated title "Beyond The Sea." It doesn't matter if it is in the chanson or pops field, this song has been picked up by a number of different singers. A sophisticated melody is played out with the accordion and the mandolin to the rhythm of the begin. They make you feel the space in the music with such a jam-packed sound, as can only be expected of them. This was the first #1 hit on the US charts by that master combo of pops best ever composer, Burt Bacharach and lyricist Hal David. In 1968 a trumpeter by the name of Herb Alpert made it a hit and in the following year Dionne Warwick made it a hit as the "This Girl's-" version. It is simple music but it is exactly what makes this reach your heart. The ukulele coloration playing in the background of the vocals unobtrusively is very effective. This is the theme song from that classic movie "The Wizard of Oz" from 1939 that the star of the film Judy Garland sang which was awarded the academy award for best song. Chuei Yoshikawa said, "this was a song that I've always wanted to play in this kind of arrangement." This is the kind of number it is, but the samba beat and the whistling melody is a very fresh kind of arrangement. It has come out to be a happy number that make people listening feel very bubbly. The last song is a beautiful ballad that Kenji Takamizu composed. The composer himself plays the harmonica on this one. Although it has not been long since he has started playing the harmonica, it is still an emotional and splendid number. People of today are busy, it is as though we are being chased around like mice. The members of the band all hope that this can become a general refreshment for that lifestyle. It is simple yet it is of high quality. It is relaxed but it is packed full of energy. So, that kind of sounds, their sounds, we would like everyone to relax as you listen and enjoy it till your hearts content. Executive Producer : Teruo Saegusa for Victor Entertainment,Inc. Special Thanks from nanan to Toshiya Kamada,Osamu Murayama (Toyo Media Relations Co., Ltd.), Keisuke Kuori,Hiroshi Watanabe & Yoko Satoh (Bird Planning), Saemi Takahashi (T-off),Chie & Kaz Masumoto (studio legacy L.A.), Tony Hugar (Audio Resource Honolulu) and ANA.